Healthy eating and healthy living in general are currently topics of mainstream interest. There have been a plethora of beliefs over the years as to what constitutes healthy eating; counting calories, avoiding carbs, only eating protein, the list goes on and on. 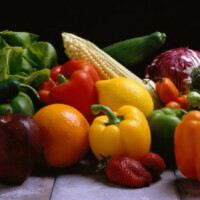 Now studies are showing, something rather obvious, that truly eating healthy evolves eating fresh produce. Foods from the earth are the secret to living a truly and completely healthy lifestyle. For years we lived under a major misconception, that counting calories was the way to find physical health. Now we are learning that counting calories is not the key to healthy living, but in fact counting calories gets in the way of what truly matters. You can count all the calories you want, but if you are not in taking the proper foods daily then you are just as unhealthy as anyone else. The key to a healthy diet is eating the right amount of raw fruits and vegetables! I know, I know, to many that may sound quite disgusting. To be a hundred percent honest the idea of constantly eating fruits and vegetables initially grossed me out as well! Well the idea of eating a lot of vegetables is what really grossed me out; fruit has always been rather delicious. Rather you like them or not is not what’s important, what is important is fueling your body with premium fuel in order for your body to perform at its optimum levels. For many though, breaking past the taste of constant vegetables is overwhelming. You have to keep in mind that vegetables are an acquired taste. This might be hard to believe, but raw fruits and vegetables have a pleasing euphoric feeling! When your body is at its optimum health levels you feel fantastic. Not only do fruits and vegetables make you feel absolutely fantastic but developing a taste for the ones you are not initially fond of is a fast process, far faster than developing other acquired tastes. It is almost as if your body feels so fantastic from the raw fruits and vegetables it tells your taste buds, so of course your taste buds listen and begin to like the raw foods as well! Once you begin to eat healthy it will drastically improve all aspects of your life. You will move around better and be able to become physically fit at a far faster rate. Not only will you notice positive physical changes in your body but also you will notice positive changes in your mind! Upon beginning a raw fruits and vegetables type diet you will notice positive changes in your ability to process thoughts and your ability to access your memory will likely be improved as well! With your mind and body working better than ever before your attitude and over all wellbeing will be greatly improved. You will be feeling better and looking better, which will give you confidence like never before. It is natural for people to flock to other positive individuals and you will now be one of those positive individuals. The decision might initially seem daunting but if you commit to eating healthy it will not be a regret, you will see an immediate impact on all aspects of your life. The positive impacts will inspire you to continue and inspire others to start.